...Kipor & Agriculture Solar-Diesel Hybrid Generator Increases Efficiency, Lowers Cost of Gas and Maintenance. 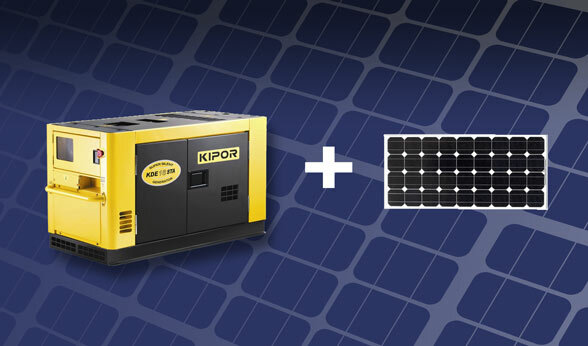 Kipor and Agriculture Solar hybrid generator sets for industrial or commercial applications. Kipor's industrial silent series offers outstanding serviceability and reliable performance in a simple, easy-to-use design. The Kipor and Agriculture Solar integrated hybrid generator models are a solar-diesel three phase generator. The silent series generators from Kipor provide low operating noise levels with fuel efficient solar-diesel engines that are suitable to power applications in rural or industrial business. • Efficient dynamics and long-lasting use. • Convenient service and installation. • Special design for harsh environment. At Agriculture Solar, Kipor Hybrid Generator and Agriculture Energies can be your simple solution. Kipor and Agriculture Solar's hybrid commercial generator sets controller is a control system independently researched and developed by Kipor and Agriculture Energies. It applies the technology of diesel generation and renewable energy integration, with the function of measurement, control and protection, and accurately measures various parameters. Cooperating with its self-developed module, it can realize the manual/auto switch control between the generator set and solar power. Agriculture Energies systems have been successfully active in the top irrigation fields for over 10 years and continues to bring the tried and true principles and advantages of solar hybrid power. Think about it, and then make your move. Let Cummins and Agriculture Solar power management provide you with decades of reliability and lasting value. We invite you to explore the possibilities of our reliable hybrid power solutions.